The Sun ~ Shine Your Light! Tarot Tuesday! 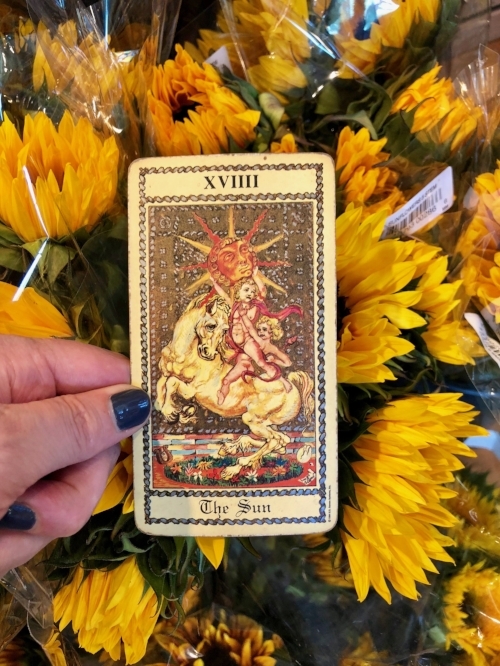 The card for the week is the Sun—perfect for the Summer Solstice on Thursday!--representing: Happiness, freedom, innocence, vitality and success. The Sun is the most joyful card of the deck, for it symbolizes freedom from the shadows of the past, a time where we are able to be fully present and experience each day as a brand new moment. The Sun’s mantra is: Everyday, in every-way, my life gets better and better! The Sun is the center of our solar system, and all planets orbit around it. This is a time to become your own Sun, and let others orbit around you. Selfish? Nah. It’s “self-full”. A good thing. The Sun’s light radiates a healthy vitality that comes from focusing and taking care of yourself--essentially feeding your light. Then you can be a greater inspiration to others. The essence of the Sun is self-expression, and when it shines it’s light your way, it is a time to give yourself permission to be creative and share your gifts to the world. Everyone has their own unique talents and gifts, and now it’s time to express them. Without worry or doubt about what other’s may think. This is the freedom of the Sun, it is a brand new innocence, the ability to just BE. Be you. The authentic you. Ultimately, the Sun’s message is simple but true: Don’t worry. Be happy. Wishing you a joyful week!